One of the three men who committed suicide at the US prison camp at Guantanamo Bay was due to be released - but did not know it, says a US lawyer. Mark Denbeaux, who represents some of the foreign detainees said the man was among 141 prisoners due to be released. He said the prisoner was not told because US officials had not decided which country he would be sent to. Meanwhile, a top US official appeared to row back from the tough line taken by other officials over the suicides. At the weekend, one top state department official called them a "good PR move to draw attention", while the camp commander said it was an "act of asymmetric warfare waged against us". "I wouldn't characterise this as a good PR move," Cully Stimson, US deputy assistance secretary of defence, told the BBC's Today programme, on Monday. "What I would say is that we are always concerned when someone takes his own life, because as Americans we value life even if it is the life of a violent terrorist captured waging war against our country." The Pentagon named the prisoner who had been recommended for transfer as 30-year-old Saudi Arabian Mani Shaman Turki al-Habardi Al-Utaybi. He was a member of a banned Saudi militant group, the defence department said. The other two men who died on Saturday morning were named as Ali Abdullah Ahmed, 28, from Yemen, and Yassar Talal al-Zahrani, 21, another Saudi Arabian. Ahmed was a mid- to high-level al-Qaeda operative who had participated in a long-term hunger strike from late 2005 to May, and was "non-compliant and hostile" to guards, the Pentagon said. Zahrani, 21, was a "front-line" Taleban fighter who helped procure weapons for use against US and coalition forces in Afghanistan, according to the department. 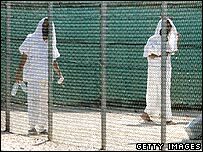 Professor Denbeaux told the BBC World Service that the feeling among detainees at the Cuba camp was one of hopelessness. "These people are told they'll be 50 by the time they get out, that they have no hope of getting out. They've been denied a hearing, they have no chance to be released," he said. He said US policy was to refuse to tell prisoners they were due to be released until a location had been found. Utaybi had been declared a "safe person, free to be released" but the US needed a country to send him to, Professor Denbeaux said. "His despair was great enough and in his ignorance he went and killed himself," he said. The prison camp at the US base in Guantanamo Bay, Cuba, holds some 460 prisoners, the vast majority without charge. There have been dozens of suicide attempts since the camp was set up four years ago - but none successful until now. Criticism of the camp is mounting, even among President Bush's Republicans. "There are tribunals established... Where we have evidence they ought to be tried, and if convicted they ought to be sentenced," said Republican Arlen Specter, chairman of the Senate Judiciary Committee. Some inmates had been detained on "the flimsiest sort of hearsay", he added. The United Nations rapporteur on torture, Manfred Nowak, said European leaders should use a summit with President George W Bush next week to press for the prison's closure. Danish Prime Minister Anders Fogh Rasmussen said procedures at Guantanamo Bay violated the rule of law and undermined the fight against terrorism. Why did Barack Obama miss his own deadline?